Over recent years the formerly renowned big trucks and SUVs have morphed into efficient crossover options. This novel utility breed is car-based like old wagons but has a taller body style of conventional sport-utilities. 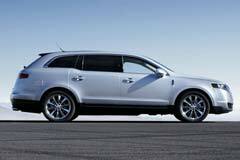 The Lincoln MKT's long 208” length is driven by a turbocharged V6 that musters up 355 horsepower. It comes in all-wheel drive, which is probably necessary as it is a heavy vehicle. Also, each MKT offers a very quiet, well trimmed cabin than you would expect in the luxury vehicle. MKT debuted in the 2010 model year. Initially, a base model was available but was removed from the alternatives list for 2012. Models made before 2013 vary in many ways, the most evident being the grille design. Also, the first 3 model years featured electronics which lacked some of the present car's MyLincoln Touch features. For some people the older versions will be easier to use. The Lincoln MKT boasts capable handling and a smooth, comfortable ride. 2014 Lincoln MKT Engine starts. Driver seat is no longer available. PA SALVAGE TITLE on hand.